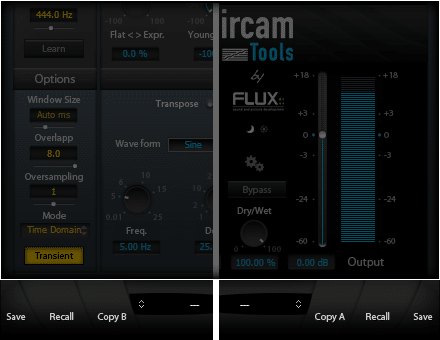 A suite of three ingenious processors using pioneering technology developed during the last decades by the sound analysis/synthesis team at IRCAM, with innovative signal transformation algorithms for altering sound characteristics such as; pitch, spectral timbre and duration to manipulate properties of a voice such as gender, age and breath. 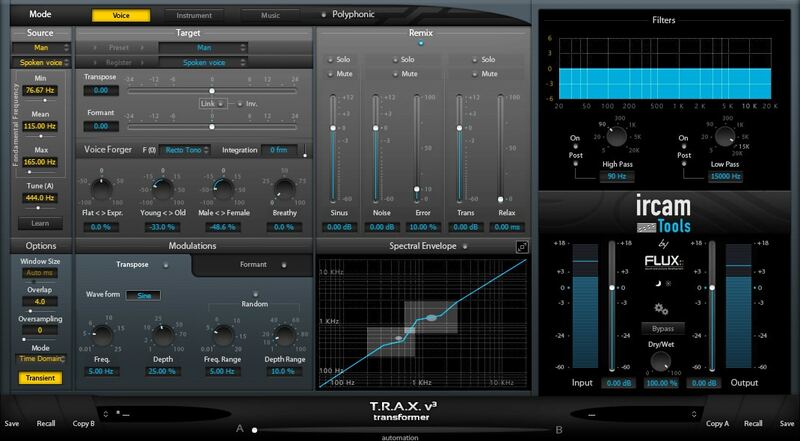 TRAX Transformer v3 is based on an augmented phase vocoder technology and a cutting edge transformation algorithm, allowing for manipulating characteristic properties of a voice such as gender, age and breath, and on any other sound; expression, formant and pitch. These voice transformation algorithms have already been used, with great success, in international and French cinema productions. (Farinelli, Vatel, Tirésia, Les amours d’Astrée and Céladon). With the Spectral Envelope complex remapping of the actual spectrum envelope, according to a freely definable curve, can be performed. Target, provide a range of options for the transformation of the source material. 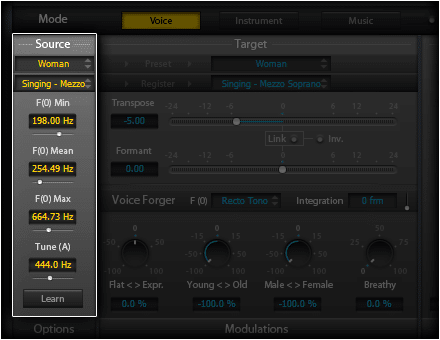 In voice mode, a range of vocal types/ranges are available, and on top of that, parameters such as gender, age and breath can be used as well. For all types of material, pitch, expression and formant are provided as well. 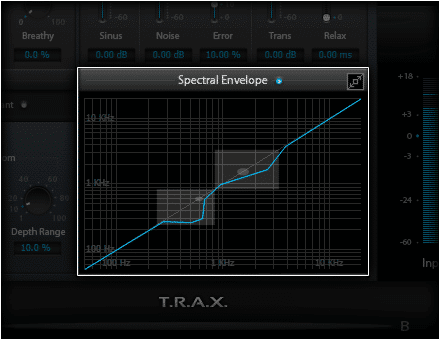 TRAX Cross Synthesis v3 utilizes a phase vocoder (the amplitude and the frequency/phase spectra), to morph the spectral characteristics of two sounds. The amplitude and frequency/phase spectra can be blended continuously and since the features that are used here are strongly nonlinear, the sound morphing is nonlinear as well, offering a way to create a wide range of new exciting and unusual sound effects. 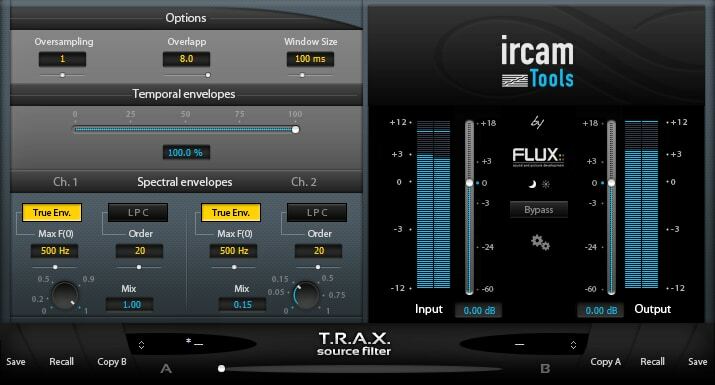 TRAX Source Filter v3 is based on a signal model decomposing the signal into a time envelope describing the energy/loudness contour of the sound, and a spectral envelope describing the spectral colour of the sound timbre. The energy contour and the spectral colour of the source sound, can be continuously blended with the spectral colour and energy contour of an arbitrary filtrating sound, allowing transformation that extend well beyond the more common source filter morphing effect. 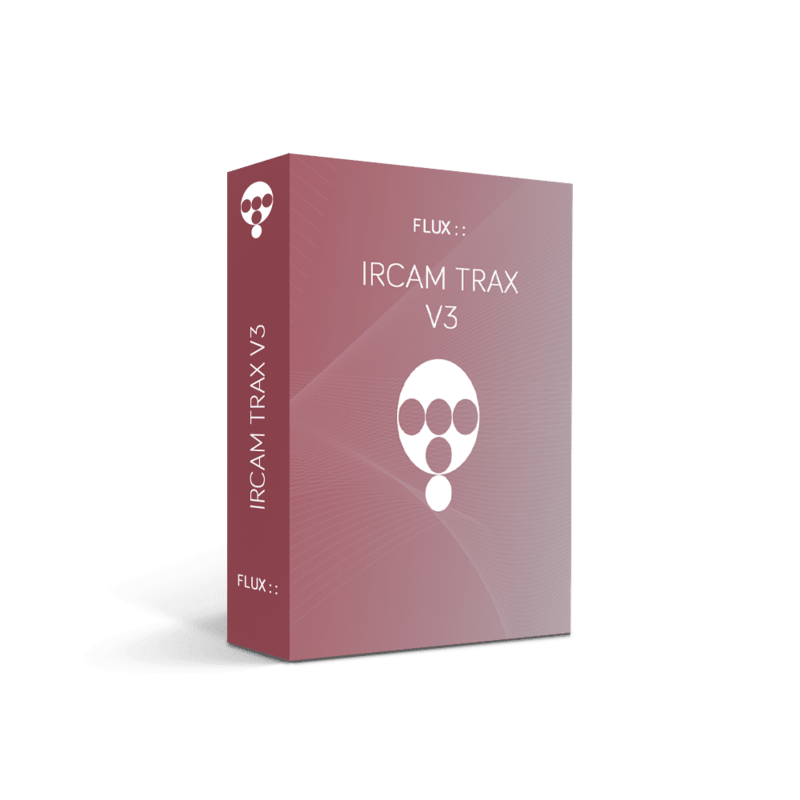 In Trax Transformer, the built in preset manager and the preset morphing slider, provides instant and intuitive control of all parameters and controls. In a second, with a simple one-click operation, everything is copied from one of the two preset slots to the other, even during playback. 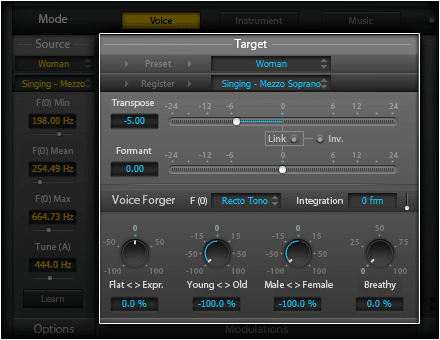 Three ingenious voice and sonic processors, Transformer, Cross Synthesis and Source Filter, for altering pitch, spectral timbre and duration to manipulate properties of a voice such as gender, age and breath. Dry/Wet mix control (Transformer) – For mixing in unprocessed signal with the processed signal. Source (Transformer) – For setting the frequency ranges of the material to be processed, with a learn function for automatic analysis of the material. Target (Transformer) – Providing a range of options for the transformation of the source material. Remix (Transformer) – A mini-mixing console where the various components of the processed audio can be mixed before sending the signal to the output. Options (Transformer) – Controlling a number of parameters affecting the analysis-re-synthesis engine. Modulations (Transformer) – For some fun and more creative and expressive processing, two modulators are provided; one for modulating the Pitch (Transpose), and one for the Formant. Spectral Envelope (Transformer)- For complex remapping of the spectrum envelope, according to a freely definable curve. Filters (Transformer) – A two-band high/low pass filter section that can be applied on the incoming or the outgoing material. Transient toggles transient processing on and off. Amplitude (Cross Synthesis) – For controlling how the output amplitude is affected by the left and right channels. Frequency (Cross Synthesis) – Controls the frequency content of the output with respect to the inputs. Window Size determines the time-frame base used to extract time localized data in time from the incoming material. Temporal Envelope (Source Filter) – Controls how much of the dynamics from channel 2 versus channel 1 will be imprinted onto the output signal. Spectral Envelope (Source Filter) – Source and Filter track extraction and analysis. 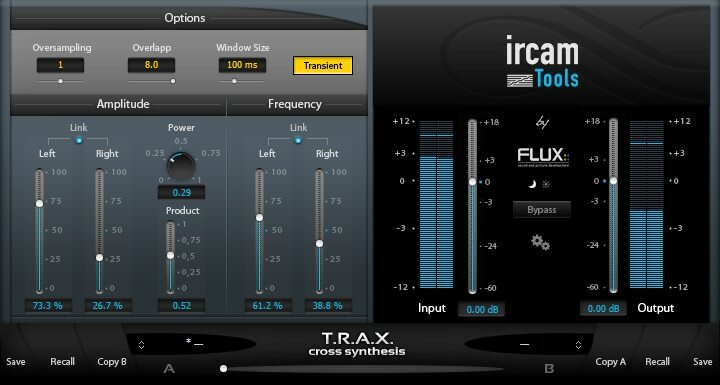 *Due to the nature of TRAX Cross Synthesis and Source Filter, they only support 2 channels Input/Output.